This very sturdy polyethylene ramp was designed with safety in mind. Run both your 50mm solution hose and vac hose under the ramp to reduce the risk of injury and liability. Folds up for easy carrying and storage. Features Nylatron bearings, positive spool stop, welded steel construction, finished with rust resistant paint. ¼ inch Female- Safe Connect. 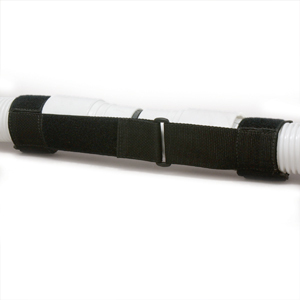 Vac Hose Coupler 2" x 1.5"
A SuperStrap does what the stairhook and hose hangers do and then some. A great way to secure your vacuum/solution hose lines up off the ground to really keep your lines out of the way. Strapping device prevents vacuum hose separation at the connectors. Fully adjustable to fit any size hose and adjust between hose pieces to any length needed. Vac Hose Metal ConSS 2" x 2"
2" x 2" Vacuum hose connector.